Epigenetics – the word is popping up everywhere, from scientific texts to adverts for genetic testing. In this article, we’re going to have a little peek at this fascinating topic and find out what it means for your health. Epigenetics can be defined as alterations in how our genes direct our cells which are not due to alterations in our DNA sequence. The human body has more than 20,000 genes. Our genes determine how tall we are programmed to grow, our appearance, and even to a certain extent our personality. Genetics can also influence how susceptible we are to develop illnesses such as cancer and diabetes. The function of a gene is to instruct cells how to act. This is called gene expression. Genes tell a brain cell to function like a brain cell or a liver cell to function like a liver cell. Genes are encoded in DNA, which is information passed down from generation to generation. Would you believe there are about six feet of DNA strands inside each and every cell of your body? To fit in, the DNA winds itself around cell structures called histones. About 30 million of these can be found in each cell. When histones and DNA inside a cell are wound tightly together, the genes cannot be read – it’s as if they are invisible to our cells. When they’re loose they can easily be read and so they’re able to instruct the cell how to behave. For many years scientists believed we’re largely at the mercy of our genes, but new research is discovering that’s not necessarily the case. The sequence of our DNA is like the text of an instruction manual. In this case it explains how to make a human body. Epigenetics can be thought of as pieces of this text which are highlighted to bring the reader’s attention to different sentences. A pink highlighter might mark parts of text which should be read carefully, a blue highlighter might mark text that’s not so important. These highlighters, called epigenetic markers, sit on the gene strands and react to signals from the outside world. The DNA is not actually altered, but the outcome is different. There are different types of epigenetic markers. They can cause genes to be activated or suppressed. Some will loosen the physical shape of the histone and DNA structure. The DNA then becomes more accessible to the proteins which activating the genes in that area. This is the pink highlighter telling the cell to take notice of that bit of information. Other epigenetic markers affect a process called DNA methylation. This helps cells interpret the instructions from genes. Little substances called methyl groups attach themselves to a gene and instruct it in what to do. Methylation tends to inhibit or prevent gene expression. It’s like that blue highlighter telling the cell it doesn’t need to know about this bit of information. Epigenetics is nature’s way of changing our cell’s behaviour. Although the DNA sequence we’re handed down from our parents is constant, the instruction manual can change over our lifetime. Which bits of the text are highlighted is influenced by environmental factors. These include the food you eat, your occupation, stress levels and even your age. Epigenetic influence can be partly explained by methylation. Certain nutrients such as B Vitamins are essential for proper methylation. On the other hand, environmental toxins can cause methyl groups to give the wrong instructions to genes. The methyl groups can even bind to and instruct the wrong cells, causing the cells to behave abnormally. The effects of epigenetic markers are not always harmful. Evidence is emerging to show exercise can have an epigenetic effect on our health. Trauma early in life, including childhood abuse can also affect the methylation patterns of our DNA (2). It’s been observed many victims of such abuse go on to suffer poor health in adulthood. The fact epigenetic changes can be transmitted from generation to generation is a very exciting discovery. Epigenetic markers appear to be able to make their way into egg and sperm cells and so influence the development of the embryo. It’s like some of the highlighting still being visible on a photocopied document. Early research on mice gave us the first clue epigenetics may be inherited. One substance which has been studied because it can alter epigenetic markers is Bisphenol A. This is a chemical found on the inside of food cans and added to many commercial products including food containers and baby bottles. It’s been linked to several diseases, including cancer, and it seems epigenetic modifications caused by exposure to Bisphenol A when in the womb can cause changes in later life. (3) BPA may exert its effect because it influences methylation. One of the most easily studied epigenetic markers is nutrition. Chemicals in foods affect whether genes are switched on or off. The mother’s diet is incredibly important in influencing the gene expression of her baby. One particular gene called agouti has been studied in mice. When this gene is unmethylated, the mouse will be yellow, obese and at risk of diabetes and cancer. Normal mice have an agouti gene which is methylated and they’re normal weight, brown and without an elevated disease risk. This is a mutation of the gene expression and the two mice are actually genetically identical. If pregnant yellow mice are fed a methyl-rich diet containing folic acid, they give birth to mostly brown pups, which do not become fat and stay healthy. So the diet in the womb influences the health of the mice throughout their entire life. It’s been discovered the DNA of children from obese parents has changes in epigenetic markers. Methylation of a specific gene appears to be connected with obesity in later life. In sheep, poor nutrition in pregnancy leads to life-long epigenetic changes in the offspring in a gene regulating energy balance and expenditure (4). Such lambs had a tendency to be obese and suffer from metabolic disorders. Effects of epigenetics can affect not only our children but our grandchildren too. When scientists looked at populations whose ancestors had lived through periods where food was incredibly scarce, they found the effects of famine on health can pass through three generations, maybe more. Starvation or nutrient deprivation in previous generations on the maternal side predisposed descendants to diabetes and cardiovascular problems (5). Other scientists looked at male ancestors and found an interesting conundrum. The availability of food for the paternal grandfather between the ages of nine and twelve influenced the lifespan of his descendants in the opposite way. They found food scarcity led to longer lifespans in his grandchildren. The reverse was also true - food abundance led to shortened lives of the grandchildren, due to either diabetes or heart disease (6). As it turns out, your grandparents and even your great grandparents could be influencing your health today! 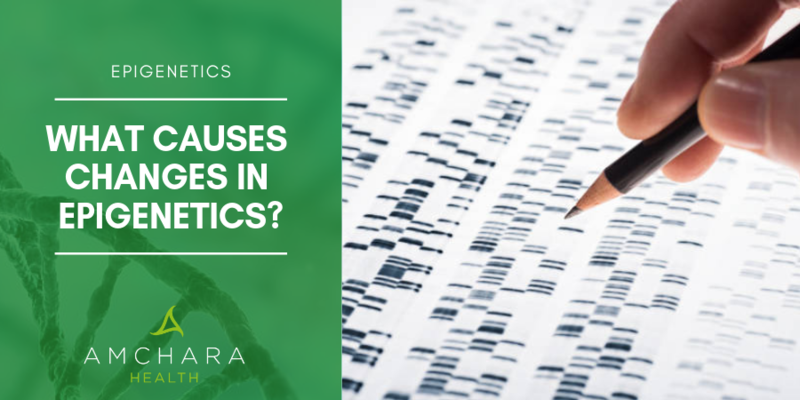 Epigenetics is now showing us the massive rise in modern diseases like heart disease, diabetes and cancer may have resulted in part from changes in our genetics from generations ago. Scientists have found many mental disorders are epigenetic, including autism, bipolar disorder, paranoid schizophrenia, post-traumatic stress and OCD. The epigenetic marks which cause them are passed on when cells divide, so the conditions persist throughout life. Exposure in adolescence to the active compound in cannabis, THC, has been found in one study to lead to a greater predisposition to heroin addiction in offspring (7). Can Epigenetic Markers be Reversed? If the epigenetic markers created by environmental influences could be reversed, it follows predispositions for certain diseases may be reduced. Science is still trying to find out if this is possible. One promising study gave leptin, the hormone which makes us feel full, to new-borns otherwise epigenetically predisposed to develop obesity and insulin resistance. Their risk was reduced (8). Any factor which could uncoil or compress DNA could potentially change abnormal gene expression. This is where nutrients come in. Certain nutrients called methyl donors are needed for proper methylation to occur. These include folic acid and other B vitamins. Eating a diet high in these nutrients could, therefore, alter gene expression. This is particularly relevant in pregnancy when the infant’s epigenetic markers are being established. Too few methyl donors in the mother’s diet can lead to lifelong under-methylation in her baby, which will affect gene expression. Even as an adult, a diet deficient in these nutrients leads to a decrease in DNA methylation, but these changes appear to be reversible when the nutrients are replaced in the diet. All this tells us we do actually have control over our genetic imprint. We have more influence on our health – and the health of our descendants – than was previously realised. Once epigenetic markers are recognised, your diet can be fine-tuned with a personalised nutritional approach aligned to your own genes and how they are communicating with your body systems. Genetic testing can take out the guesswork and so personalise your nutrition exactly for you and your specific needs. 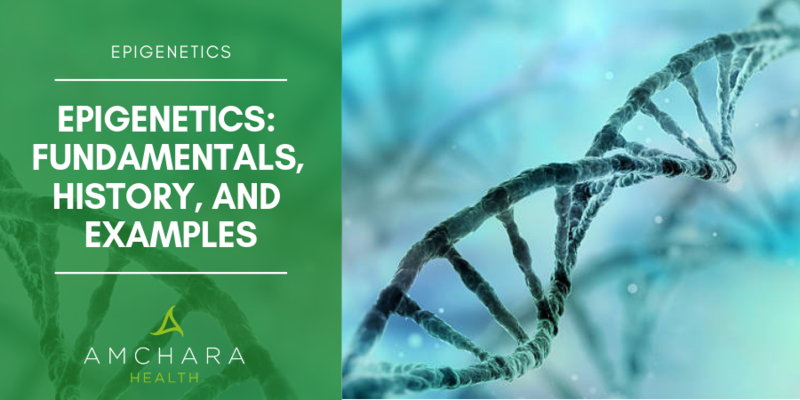 Amchara practitioners embrace this latest knowledge about epigenetics to create a health plan completely personal to you. Your personalised health programme will not only look at your genetic makeup using innovative testing methods but will also examine factors which may be influencing your gene expression. ‘It’s in your genes’…or is it?